Surya World is located in lush green surroundings and has world class infrastructure. 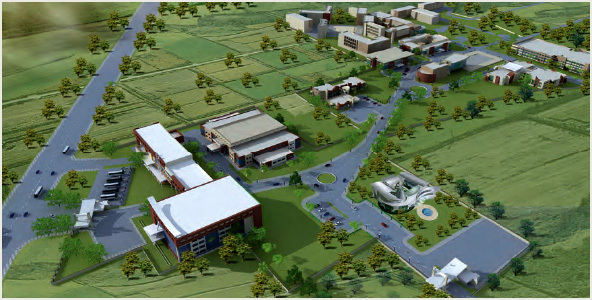 The ergonomically designed campus has centrally air conditioned buildings encompassed in an aesthetically designed and beautifully landscaped campus. Classrooms: Fully air-conditioned and elegantly furnished classrooms with designer furniture are equipped with modern Wi-Fi systems. Classrooms are spacious and well ventilated with ample natural and artificial lighting. Stateof-the-art interactive classroom boards, computer and web based training make the concepts easily understandable. Modern teaching aids like display and LCD projection equipment further facilitate the learning process. 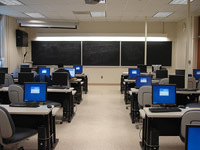 Smart boards allow recording of lectures with explanations to be available to students free of cost to enable them to concentrate on lectures and interact with teachers. Students are advised to copy recordings (available on web) on their laptops. Workshops: Learning practical skills is primary requirement of any engineering graduate. Modern spacious workshops are available fully equipped and manned by competent and experienced professionals. All round skill development of students is the focus. Continuous evaluation for feedback for on-course correctives with individualized attention boosts the performance of students significantly. Workshop facilities include Carpentry, Electrical, Fitting, Foundry, Machine, Sheet Metal, Smithy & Forging and Welding workshops. Laboratories: Laboratory practice is the back bone for every course. Concepts of theory can be assimilated through practice in laboratories. The student starts with planning followed by component and equipment selection, setting up the system, performs the experiment under guidance and finally analyses the results to make appropriate conclusions thus consolidating the subject knowledge. The laboratories have been equipped not only for course requirements but to offer facilities for learning beyond curriculum and encourage Research & Development. Internet Connectivity: Availability and sharing of information is the key to professional success in the world today. Internet connectivity with large bandwidth through Fiber link is the core to it. This Integrated campus offers 10mbps up/down link along with Wi-Fi (indoor and outdoor) for round-the-clock usage of the students. Our Library is stocked with more than 2 lakhs e-books from international publications. Our Library is stocked with more than 8, 000 national & international e-Journals. English Lab : It is designed to enhance students' language & communication skills, pronunciation accuracy, and eliminate MTI (Mother Tongue Influence). Career Lab : In today's competitive environment, besides the sound domain knowledge, career skills viz., communication and soft skills and basic computer skills are most sought by employers in their prospective employee. Besides enhancing employability and career prospects of students, these skills are essential in day-to-day life. Career Lab is designed to impart crucial career skills to students to make them confident and successful in career in life. The Library is a pivot around which all academic activities revolve. To support and supplement the learning within the classroom, E-Library with digital audio visual facilities and reading material on electronic media is available for the students. 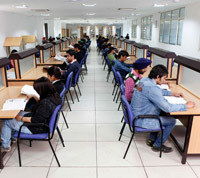 Each institute has its own library facility. With an E-library, students have the access to their books on computer and make notes while sitting in the hostel. It makes learning easier and faster. Each library subscribes to national and international journals, periodicals and magazines on current affairs and books of general interest to keep students updated about the latest trends and innovations. Similarly national and regional dailies keep the students updated with current affairs. Tuck Shop & Viva Store: The institute has its own tuckshop and VIVA store which cater to the everyday needs and necessities of all the students. The hostel residents benefit the most from the tuck-shop as they can buy necessities at their convenience. Materials like stationery items, eatables and soft drinks are available at the tuck-shop and VIVA store. Banking ATM Facilities: 24 hours ATM facility of ICICI Bank and PNB is available in the campus. Medical Facilities: The campus is very particular about the health of the students. Medical treatment facility is available on campus. We also have a state-of-the-art Dental Clinic at Surya World which is equipped with ultra modern Dental Chairs fitted with X-ray Machine and other sophisticated equipment. Transport Facility: Surya World has its own transport service between campus and the nearby towns like Sirhind, Rajpura, Patiala, Khanna, Chandigarh, Mohali, Panchkula, Ambala and other towns/cities within a radius of about 60 kms. Air conditioned luxury buses fitted with LCDs offer comfortable travel to our students. Ideally located on NH-1, the campus has the advantage of state transport and private transport having their pickup / drop points very close to Surya World. Round the Clock Security:The campus is a fully secure campus with smart card access for the students. No one can enter the premises without proper authorization, which is further verified. This is backed by well trained guards and round the clock security system.